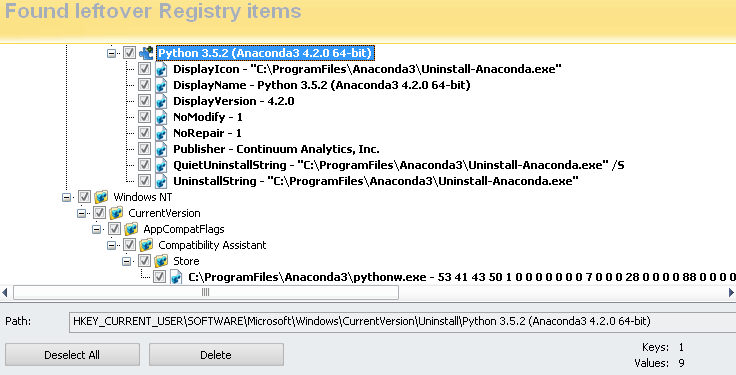 I attempted to update Anaconda Navigator (1.3.1 → 1.3.2) because apparently the downloadable installer that continuum.io hosts does not contain the absolute latest version of many things. But unfortunately it crashed during the update process. Maybe that's why it's not included? Anyway, let's not get sidetracked and instead continue with the bug report; I would attach the update logs. (But where are they?) So far I only found 200kb worth of mostly nothing in my \.anaconda\navigator\logs\ subfolder inside /Users/. (The whole thing compresses to a mere 13 kb.) The one error line in it is quoted verbatim at the end of my post (likely not relevant though). A possible mistake I recall committing was that I ran Anaconda Navigator elevated, with full admin rights. Just so it could write to Program Files. I wish to cherry pick what gets downloaded and installed and what doesn't. Current installer has no options for this. More than half the libraries, currently clocking in at over 2.8 GB in size, probably aren't necessary for a beginner. I never use the less fancy consoles either. Just the graphical IDE for me thank you. And no web-based notebooks on localhost please. Nor superfluous runtimes. Uninstall does not remove all registry entries so now I have an unclickable, already uninstalled line in control panel → add/remove programs. After the third reinstall, I finally learned my lesson and ignored Navigator's request for updating itself. However, several other applications were outdated as well. They are multiple versions behind, in fact. 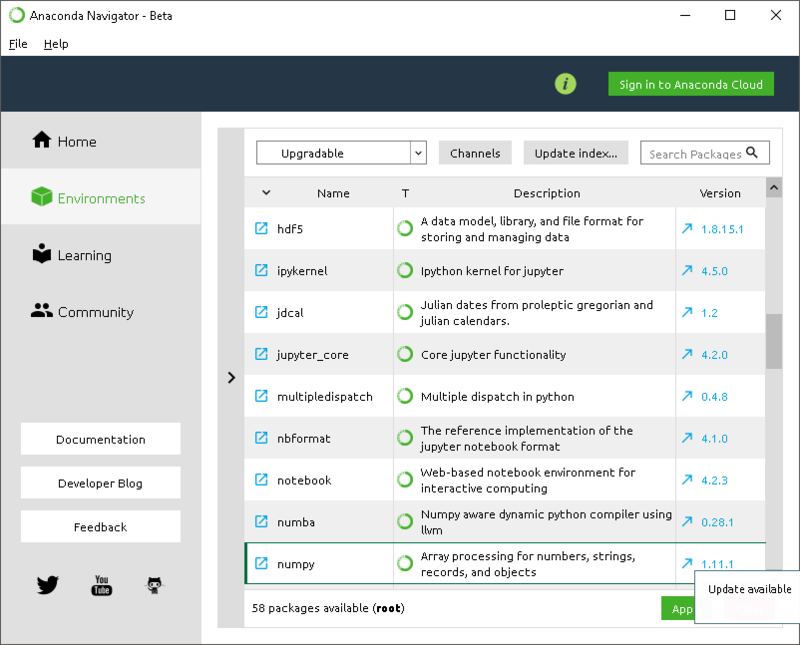 I had to update spyder to 3.0.2 (skipping 3.0.1 entirely) and jupyter from 4.2.3 to 4.3.0 which was a whole major version behind. I downloaded the installer just five minutes ago, why is most everything in it expired right out of the box? There are no references to qt-5.6.0 anywhere, so why wasn't it cleaned up? 300 MB wasted... Free space is rather precious on my small SSD. p.s. : Starting my Machine Learning course in two weeks. More than enough time for me to fix this all up until then. Now I definitely do not want to do that. My roaming profile can absolutely not handle a 2.8GB monster folder cloned under my home directory. Only difference is it's all on one line with `\n`s and other escaped characters. Original title was: "Anaconda Navigator crashed during update, so now I'm stuck with a Navigator that uninstalled itself and cannot be repaired unless I redownload and reinstall the whole 1.7GB Anaconda software family. Also several items were outdated right away even though I chose the latest available version. Uninstall does not remove all registry entries so now I have an unclickable, already uninstalled line in control panel → add/remove programs."